AP AGRICET 2019 Results, BSc Agriculture Entrance Test 2019 Results, Acharya N.G. 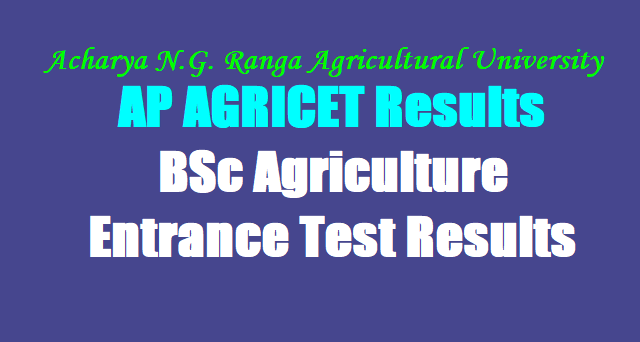 Ranga AGRICET 2019 Results for BSc Agriculture Course Admissions 2019-18/ BSc Agriculture Entrance Test 2019 Results for Agriculture and Seed Technology Admissions 2019: Acharya N.G. Ranga Agricultural University, Hyderabad had issued the Andhra Pradesh ANGRAU AGRICET 2019 Notification in May, 2019. Acharya N.G. Ranga Agricultural University invites applications from Diploma holders in Agriculture and Seed Technology for admission into four years B.Sc. (Ag.) Degree programme through AGRICET 2019 for the academic year 2019 -20. The University Officials invited the applications in the prescribed form from 25-05-2019 to 24-06-2019 from the eligible Diploma holders in Agriculture and Seed Technology for admission into (4)four years B.Sc. (Ag.) Degree Programme for the academic year 2019 -18. Qualifying marks for AGRICET 2019. Merit list of candidates candidates applied for various diploma courses in ANGRAU: The merit list of the candidates will be displayed in the University website and the eligible candidates shall be informed about the counseling date by post or through the University website. For the preparation of merit list, in case of more than one student securing the same combined score obtained, the tie shall be resolved to decide the relative ranking by successively considering the following. The OMR Answer sheets of AGRICET-2019 will be preserved for one year from the date of publication of results after which they shall be disposed off.